Peru is a fascinating country with spectacular landscapes and rich history - its most important attraction, the ruins of Machu Picchu are truly magnificent. Traveling to Machu Picchu, do not take buses all the way from the base town - Aguas Calientes. If you like and are able to hike, do the hikes to Machu Picchu and around. 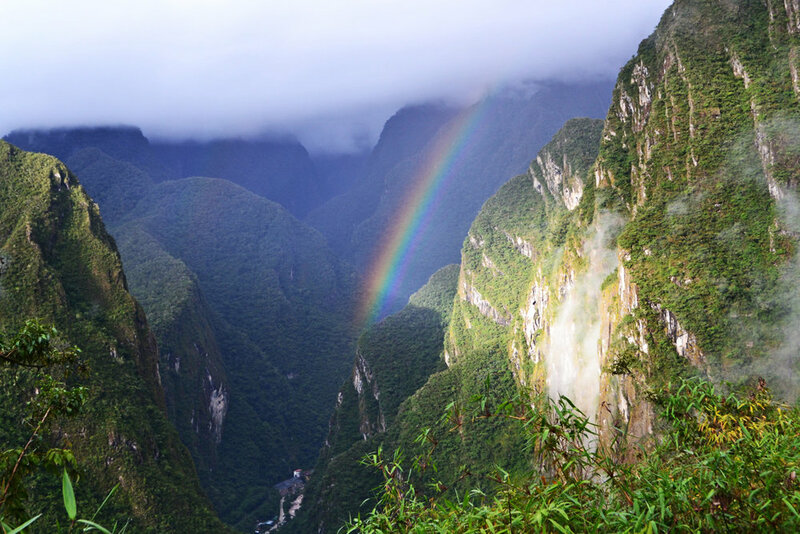 It will help you appreciate the beauty of Peruvian Andes as well as the Machu Picchu site itself. Getting to Machu Picchu may be quite difficult and confusing, that's why I've described in detail how to do it in a best way - from Cuzco to the very top of Machu Pucchu Mountain. Cuzco, Cusco or Quscu (in Quechua) is one of the most popular cities i Peru. It was the capital of The Inca Empire and some traces if its grandeur are still visible - both in Cuzco and in the surrounding areas. The city can boast a significant indigenous population and is a perfect gateway to one of the most famous sites of the ancient world - Machu Picchu. Surrounded by green mountains, located at over 3,400m (11,155 ft.) above the sea level, Cuzco has a very specific and original climate. Although most of the visitors head straight towards Machu Picchu, at least one full day spent in The Inca Empire capital is really worth it! Ollantaytambo, located at 2792 meters (9160 feet), lies in the picturesque Sacred Valley on the Patacancha river near the town of Urubamba, in between the capital city of the Incas - Cuzco and the Machu Picchu ruins. It's not as well known as the spectacular ancient city of Machu Picchu, but nonetheless worth visiting for those who want to learn more about the Inca Empire. The ruins, perched atop of nearby hills, give silent testimony of once advanced and highly organized civilization. Ollantaytambo is usually a stop for all tourists who come to see Machu Picchu, you should reserve at least one day for visiting, either on the way to Machu Picchu or while coming back to Cuzco. Good weather didn't last long though, after 15 minutes clouds came back and, like milk, spilled all over the valley. Now we could only see the infinite whiteness. The way down was harder and more slippery, our legs were in pain. However, it was faster to go down than up and we were back at the ruins at around 3 pm. Because of lack of time, we hadn't prepared any food the previous day to take to Machu Picchu, so we didn't have a choice but to try the cuisine at the Sanctuary Logde Restaurant. The price for a meal was very expensive, 43 USD per person, but you could eat as much as you wanted and also, we were given a little badge with the drawing of the ruins, as consolation, I think, for paying that much. However, the food was excellent. In the previous post "How to get to Machu Picchu", I mentioned about the few ways on how to get to the ruins. You can go straight from Cusco, or you can go to Ollantaytambo first, stay there overnight, and then take the morning train to Aguas Calientes. Many people recommend this stay in Ollantaytambo, because in Aguas Calientes (start point to Machu Picchu), there is not much too see, it is built mainly to accommodate and serve tourists. However, if you have only one day to visit the Machu Picchu site, I would say it is better for you to be in Aguas Calientes the night before. This is because you really have to wake up and start climbing as early as possible, and if you decide to visit Wayna (or Huayna) Picchu and Machu Picchu Mountain, you will need a lot of time for this. Machu Picchu, located 2400 meters above sea level, is without any doubts one of the most breathtaking tourist destinations. However, it is not very easily accessible, but nonetheless, worth the effort! First, quite a long trip awaits you from Cusco to Aguas Calientes. Then, if you are fit enough you can walk and then climb the mountain with the ruins (quite steep and difficult, for about 1,5 hours) from the village of Aguas Calientes, which is basically the base for tourists visiting Machu Picchu (with the exception of the Sanctuary Lodge Hotel right beside the ruins, the only hotel at the site - 'only' about 700 USD per night).